It’s not your Mama’s Kitchen. It’s more like Great (great,great) Grandma’s kitchen. 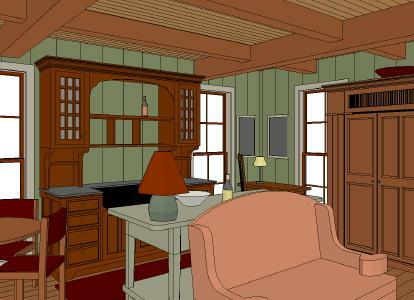 Its a Period Style Kitchen With Attitude! 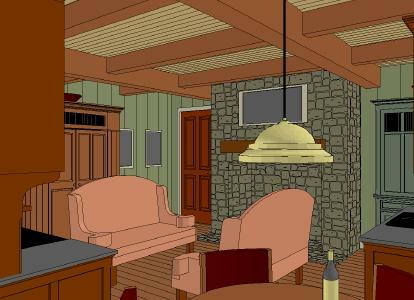 Wood beams, an old plank floor, tongue and groove ceiling, board and batten wood walls, big windows and lots of them. This Period Style kitchen is like the old keeping room of a 19th century stone farmhouse. It was once both the main workroom and informal socializing room for the home. Now it needs to be updated, but the owners want to keep its original character. 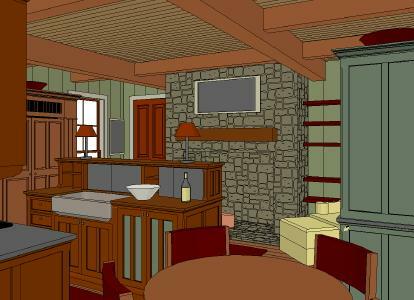 It is still the ‘hub’ of the house, a tough working kitchen with more emphasis on leisure activities than ever before. It’s got a fireplace, a really big one. The kind that was used for cooking as well as space heating and now it just works great as a focal point that can keep a very cozy fire. And all those windows bring in a lot of light but make it difficult to install normal cabinetry because the window sills are below countertop height. 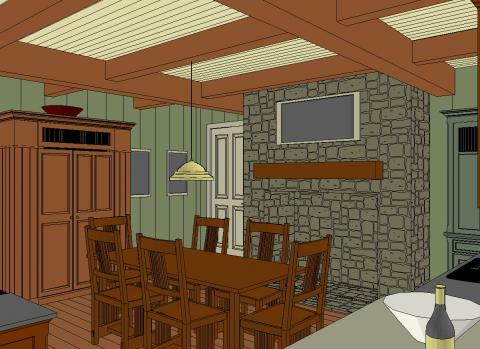 Shown here in these renderings are 4 arrangements of the same 17′-6″ by 18′-6″ room. Each design features a different way to use the center of the room. Since many of the pieces are interchangeable, many other arrangements are possible. There are of course so many other arrangements and design constraints when designing period style kitchens. We’ve tried to illustrate some of the more common issues with the designs featured above. But if you have the desire to really explore the nuances of a particular style, we hope you will allow YesterTec to help you discover the design that is just right for you. Sometimes just blending one or two YesterTec pieces that have special functions into a design that incorporates other antique pieces or even period style built-in cabinetry can be just the right thing to do. After all, if Great (great, great) Grandma could do it with such limited resources, just think of what you can do. Previous ArticleKitchen Workstations can be for you!